Here's a page designed to put you in the Christmas spirit! 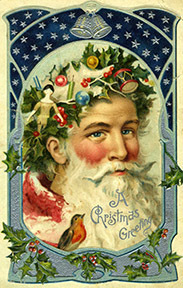 Great Christmas poems from days gone by, some advice on holiday coping, and even an explanation of "wassail!" We'll start with "A Letter to Santa Claus" originally intended for a girl to give as a school recitation at a Christmas programme. It is taken from The American Speaker and Writer, circa 1908. We find it both charming and thought-provoking, and hope you will, too. Blessed old Santa Claus! King of delights! What are you doing these long winter nights? Wonderful gifts for the girls and the boys? Pray let me give you a bit of advice. This is the time to remember the poor. You should be clothed in the warmest of hose. Till the sad faces were happy and bright. How many children have nothing at all? Out in the cold and the wind and the storms? Pining in hunger and cold till they die? Bring a small gift to your friend - Kitty Clover. Twelfth Night occurs twelve days after Christmas, and is the traditional time for decorations to be taken down, marking the end of the Christmas season. Traditionally, a Twelfth Night cake was eaten on the occasion (probably the invention of my ancestors - any excuse to have cake! ), which the French refer to as galette des rois. With the gleam of its fierce headlight. "He never can catch us here," she said. "The train is going too fast." I'll hang my stocking up here." And stole into his heart. Ere he was back again. He laid by the dreamer's side. He caught the train you see." And came aboard that night. For he never says, "I am Santa Claus,"
But his good deeds always show him. "Wassail" is one of those words that one comes across occasionally at Christmastime, and for one reason or another never gets around to looking up. Basically, it's a toast or pledge, sort of the equivalent of "to your health." Tennyson refers to this usage in The Princess when he writes "We did but . . . pledge you all in wassail." The origin of the word goes back to Middle English and Old Danish. As you doe give them Wassailling." Wassail-bowl - The bowl in which wassail (i.e, drink) was mixed and served. Wassail-bread - Bread eaten at a wassail (i.e., a celebration in which pledging was done). Wassail-candle - A candle used at a wassail. Wassail-cup - A cup from which wassail was drunk. A nice idea for the holidays, doesn't cost a dime, guaranteed to put you in the right Christmas spirit: have every member of your family (or everyone in your group of friends) select a poem about Christmas, and organize a Christmas poetry reading some time before the big day. Have one person coordinate the readings, so you don't all show up with the same poem! Food is always welcome at holiday gatherings, but for a Christmas poetry reading you don't need to go overboard. Eggnog is always a good idea, with or without spirits as your tastes dictate. Children can - and should! - participate in the Christmas poetry reading. It's a great way to expose children to poetry in a fun, non-academic setting. I've offered a few poems below to get you started, but the fun is in the hunt, so use these only as a last-minute fall-back. In stockings soft and white. For him that loves a child. Dickens, Charles - A Christmas Carol. This is such a great story and, come on, you've seen all those animated adaptations (though I like Mr. Magoo...), so read the book. It's short, and it's a nice Christmas tradition. Better yet, have you and your loved one(s) take turns reading it to each other. Henry, O. - The Gift of the Magi (short story). Does Santa Claus really exist? Read Francis P. Church's famous editorial, "Yes, Virginia, There Is a Santa Claus," and decide for yourself. Want more Christmas poetry? How about an old favorite, "The Cowboy's Christmas Ball?" "On Christmas Eve it was lately the custom at York to carry mistletoe to the high altar of the Cathedral, and to proclaim a public and universal liberty, pardon and freedom to all sorts of inferior and even wicked people at the gates of the city towards the four quarters of heaven." There's nothing wrong with trying to keep the spirit of Christmas in one's heart all year long, and while your neighbors would probably not appreciate you leaving your lights up all year, there are other ways. Collecting things related to Christmas - books, decorations, snow globes, etc. - comes to mind. As for stamp collecting, the American Topical Association estimates that there are over 6,400 postage stamps related to Christmas.